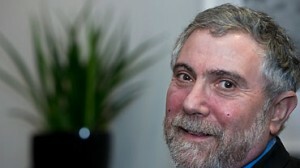 Paul Krugman: "Huge Mistake to Introduce the Euro"
Today Paul Krugman gave an interview in SVT Swedish public television. He said it was a big mistake to introduce the euro. Eight years ago at a seminar organized by Arbetslivsinstitutet (the National Institute for Working Life / NIWL) and the Trade Union Confederation LO he said it would be big mistake to introduce the euro. True today, true in 2003, the year of the Swedish referendum on joining the euro or not – naught won. In the interview in the news program Aktuellt at 9 PM tonight, Nobel Prize laureate and Princeton professor Paul Krugman said that lack of essential preconditions for a common European currency creates today’s deep economic and political crisis in Europe. He said, as I recall it, that for these three reasons it is a bad idea to introduce the euro, it will simply not work well. So, in conclusion, it was premature to introduce the euro. Basically: The necessary preconditions for a succesful common currency (the euro) were not there and they still are not there. According to Krugman, the introduction of the euro, combined with the inability of the American political system to make necessary changes (mainly due to the Republican party resistance to tax increases) are the two factors that create todays deep crisis in the world economy. And Krugman concludes, the difficult situation will be there for the next ten years. Krugman was right in his analysis and prognosis in 2003, and right in his analysis after the fact today. Sad so many people did not listen in 2003. Krugman makes it easy for himself, dropping wise ”See, what did I tell you!” remarks around himself. Thats probably why is so popular in the press. In CNN he just recently said that the world debt will go away if we just had enough fiscal stimuli. Thats not true at all, he is merely dusting off old keynesian tricks and we know those dont work in the long run. Björn, thanks for your comment. First, in this case it is not Krugman saying ’what did I say’, but me referring to his 2003 seminar. And I suppose he, and I, believe more in Keynesianism than in neoliberal ideas But of course not only spending, but tightening government budgets is needed.